Looking forward to the glamour, excitement and razzamatazz of EE British Academy Film Awards weekend, it’s easy to forget that like most award ceremonies, it started out in a much smaller way. 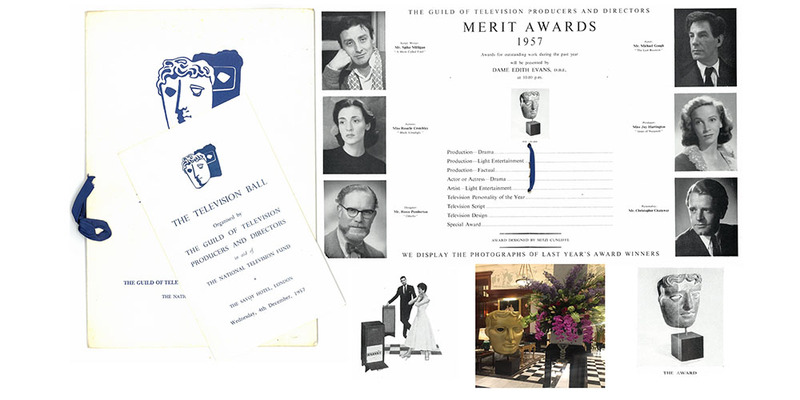 In 1955, The Guild of Television Producers and Directors held a short awards ceremony in The Savoy’s Lancaster Ballroom as just part of the entertainment at the first “Television Ball”. The ceremony was so short that it did not begin until 10pm, after the main dinner. There were only seven awards. Here are some images from the programme and menu for the 3rd Television Ball, held again at The Savoy, in 1957. By now there were already eleven categories, but interestingly the award for best actor and actress had been merged into a single award for “best actor or actress”. Perhaps this was an attempt to shorten the award list, as again the winners were announced after dinner. The most interesting thing in the programme is a photograph of the original trophy designed in 1955. This has not changed at all in over 60 years.